Emerald Ball’s countdown clock has less than 1 day, but since I’m not dancing until the second day of the comp, I’m giving my countdown an extra day. I took a prescribed break from ballroom over the weekend. Teacher says I’m ready, and I feel ready more or less. But with the few comps I’ve done, there has always been a time right before the big day when the sheer cost of everything hits me hard and I once again question what I’m doing. For this comp, that time came this past Saturday night. I’ve been sleeping on an air mattress for the past few months (long story) and finally was dragged to a furniture store on Saturday by my caring friend/roommate to look at real mattresses and bed frames. I actually found a bed frame I really liked and a mattress that was very comfortable. The bed frame was a little too long for the space where my air mattress is now, but if I sold my current bureau and bought the narrower one that matched the bed frame, everything would fit and even match. Great! Only problem is it’s going to cost me almost $2k. Not unheard of for a bedroom set, but as I pondered the purchase later that night, I had to acknowledge the fact that I could afford a one-time big purchase like that if I wasn’t dancing. Or if I at least wasn’t dancing competitively. I still haven’t figured out how I’m going to pay for Nationals or Ohio. I really want to go, but am I being stupid? Maybe I can hold my own in the ballroom world when it comes to the dancing. But the money? I’m way out of my league. Most of my fellow competitors live in a different world than mine. While others stay in hotel suites and eat from the room service menu, I stay in the cheapest room available (after checking for cheaper nearby hotels) and bring oatmeal packets and trail mix for meals. So I have to wonder if I’m trying to belong in a world that I don’t fit in. Once again, I feel like the servant girl trying to sneak into the grand ball and pretend to be a lady for a night. Sure, I have the passion, I have the love of dance that should qualify me for this world. But is it enough? 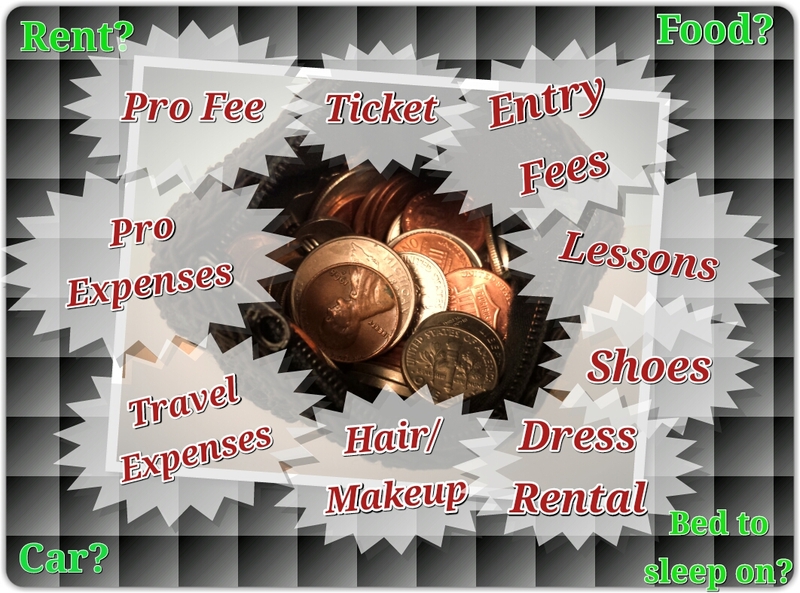 I think about the other larger expenses I would like to put money toward. It would be nice to have a bed that my dogs couldn’t accidentally poke a hole in and deflate in the middle of the night. My car could use some body work. She’s 9 years old and I’d like her to last at least another 5. Then there are those silly things like rent and food. My little pile of money disappears real quick when I add dance to the budget, let alone a comp. This isn’t an unusual problem. Everyone (in my world at least) has that list of wants and needs that has to be constantly balanced and shuffled around and reorganized. We can’t have it all unfortunately, so we make priorities. Dance has been a big priority for me. But am I wrong to put it so high on the list? Shouldn’t I fix the torn seat in my car and buy myself a decent bed to sleep on instead of going to Nationals? I can’t do it all. I struggled with these thoughts a lot during the Holiday comp in December. I started preparing myself for it to be the last comp I ever did. It was just all too much. But then January came and the universe opened doors of opportunities and good fortune to me and I found myself with enough money to do CalOpen. Same with Emerald. Wait, I’ve managed to fund two more comps after the one I thought would be my last?? So maybe I don’t give up on Nationals or my new bed just yet. Memorial Day is coming, and furniture stores love to have holiday sales. I have some things besides my bureau that I could try to sell. Anyone need editing or writing work done?? I’m available. I may not know yet how I’ll pay for my comp goals or a new bed or to fix up my car. But I have to keep reminding myself that I’ve done a pretty good job of figuring it out so far. Somehow my hard work pays off, and usually I don’t see the reward coming until it’s already here. So while I still feel like I’m crazy for setting these lofty goals for myself, I also feel strongly that the big dreams that are worth fighting for are going to sound a little crazy, require risk and struggle, and come paired with doubt and fear. Risk, struggle, doubt, fear? Check, check, check, and check. I must be on the right track. I want to hear from you! What crazy, funny, weird, clever, extreme, etc. 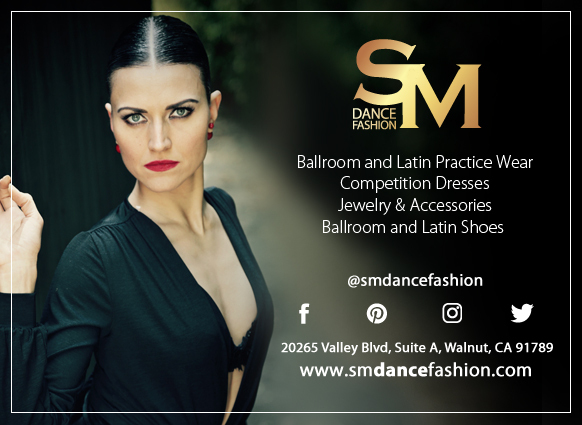 things have you done to help fund your ballroom or other dreams? My favorite symbolic moment of “I will do whatever I have to” was making my morning tea with hot water from the bathroom sink in my hotel room. Comment below! Night shifts. Lots of them. With no sleep afterward. Unfortunately, the boss hired someone to fill those, so now I need to find another source of extra income. I ate granola bars and beef jerky at the comp I went to. I only stayed the one night before and drove home afterward – I got home at 2 am. I always bring my own tea. Love the mental picture of you making tea with sink water. I would do the same thing. A girl needs her tea. 2 am will probably be my home arrival time after Emerald. I’m driving there and then home after, but my last dances are scheduled to start at 11:52pm! Good thing I took some time off of work the next day.